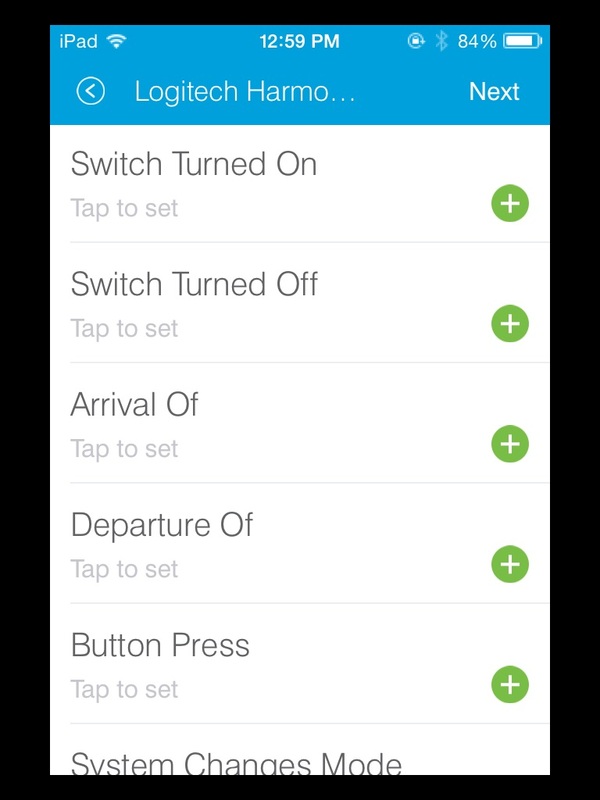 Harmony integration requires a one time set up process for each Harmony Hub/Remote to connect it to SmartThings as a device, using the official "Harmony (Connect)" smartapp. Once connected, the Harmony Hub will show up in the Things list in the SmartThings mobile app. After that, there is a one time set up process for each harmony activity that you wish to trigger from SmartThings, using the official "Harmony Trigger Smartapp" found in the Marketplace section of the SmartThings mobile app. For some accounts, this smartapp will be named "Harmony Control" (not "Harmony Connect") instead. Just use whichever one is available to you. Once created, each Harmony trigger will be listed on the smartapps list in the Rooms section of the official SmartThings mobile app. If you have any inactive hub/remotes on your harmony account, SmartThings will be unable to complete the setup process for the Harmony Connect Smartapp. You must remove the inactive device entries from your Harmony account before attempting the SmartThings setup. Harmony remote and Hubs must be updated with the most recent firmware in order to be added to the SmartThings integration. Harmony integration is currently not available in the UK due to the OAuth problem. The device type will be automatically assigned when you use the official "Harmony connect" smartapp. This page was last edited on 11 November 2015, at 11:40.